As Walgreens pushes to open a seventh store in the city, small businesses worry they could become collateral damage of the competition between large corporations. 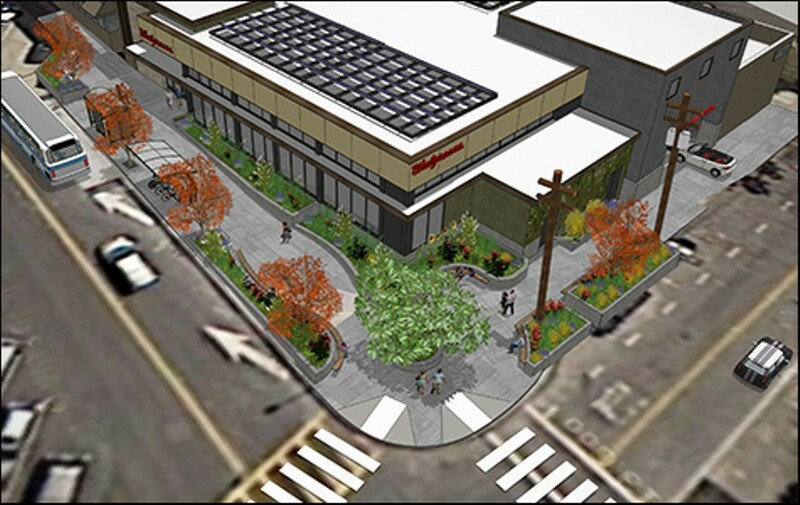 The proposed Walgreens on Solano Avenue would be the company's seventh store in Berkeley. Payn's Stationery has sold office supplies and greeting cards for more than six decades at 1791 Solano Avenue in North Berkeley. But owner Sonny Han, who has run the business for the last fifteen years, said he fears he may soon have to shut his doors. "My livelihood is on the line," he said. "I hear about corporate America taking over retail, but I haven't really felt it until now." Han's anxieties stem from a proposed Walgreens store at 1830 Solano Avenue, one block away. "Whatever I'm selling here, they'll be selling there." Han has heard supporters of the project argue that the new development would help existing stores with increased foot traffic, but he's not convinced. "I try to be open-minded," he said, but added that if the store opens it would make the closure of Payn's Stationery a "very realistic possibility." The proposal for the Walgreens on Solano — which would be the corporation's seventh location in Berkeley — has sparked a backlash from neighborhood residents and merchants in recent months and reignited a policy debate about how to limit the proliferation of chains and big box stores. The proposal from Agree Realty Corporation, a Michigan-based company that acquires and develops retail properties throughout the country, is to build a 9,972-square-foot Walgreens on the corner of Solano and Colusa avenues, which would require the demolition of a 76 gas station currently at the site. The firm submitted a preliminary design proposal to the city in January, one of the first steps in the lengthy public review process. Through this development, Agree Realty says it would clean up environmental contamination at the location and provide public seating areas and "parklet gardens" outside of the store. Critics of the project, including more than 2,700 people who have signed a MoveOn.org petition opposing the new Walgreens store, contend that the chain pharmacy is not needed in the neighborhood and would hurt existing businesses. In addition to the city's six Walgreens — one of which is on Shattuck Avenue just 1.4 miles from the proposed Solano Avenue store — Berkeley is also home to three CVS stores (and a fourth nearby in Albany). And as Walgreens and CVS aggressively compete to dominate the East Bay market, corridors like the Solano Avenue business district, which spans 26 blocks from Berkeley to Albany, stand to suffer, opponents say. Solano Avenue already has four pharmacies — Sal's Pharmacy and a Pharmaca store, which are both within two blocks of the project site, in addition to a nearby CVS and Safeway pharmacy. "These stores are formulaic, all vanilla, homogenous stores that will equal homogenous neighborhoods," Dayna Davis, a Thousand Oaks resident who created the online petition, said at a Berkeley Planning Commission meeting last week. "Chain stores drive out small businesses, resulting in empty storefronts." Christine Colton, a longtime Berkeley resident who lives blocks away from the proposed site, argued that there are two potential consequences if the chain opens this location. "People start shopping at Walgreens and pretty much all the unique stores nearby find they don't have enough business to sustain themselves." The other outcome, she said, is that "people don't shop at Walgreens and Walgreens finds that it is not a profitable store and we are left with a big huge ugly building." Colton is part of a group called No Solano Walgreens that has protested the development since it was first announced late last year. "It doesn't fit the character of Upper Solano," said Chris Gilbert, another No Solano Walgreens organizer, adding, "If they pulled out, what other businesses could move into such a large store?" In recent weeks, opponents have also been advocating for a zoning ordinance amendment that would limit the development of new drugstores near existing ones. The Berkeley City Council first raised the idea in 2011, but the proposal didn't go anywhere. Since Walgreens' new expansion goals went public, city officials have revisited the concept, most recently with the Planning and Development Department crafting draft language to ban new drugstores larger than 5,000 square feet within 1,000 feet of existing pharmacies. The city's Planning Commission voted to advance the proposal to the city council last week, recommending that the ban apply only to certain commercial districts. Opponents of Walgreens hope the city council will approve and pass the amendment in the coming months in time to block the Solano Avenue project. "I have been concerned in general about the proliferation of CVS and Walgreens in the city," Councilmember Laurie Capitelli told me. "There are times when I think that Berkeley is ground zero for the battle between Walgreens and CVS." Capitelli, who requested in 2011 that the city draft an ordinance limiting drugstores, said he couldn't prematurely comment on the new zoning proposal or the Solano Avenue project. He said that while some retail corporations can be a good addition to certain neighborhoods, there are always concerns that a new chain outlet "homogenizes our commercial districts." Zoning debates aside — some opponents of the Solano Avenue project question whether an overly broad ban on new drugstores is a smart public policy approach — it's clear that independent merchants can get caught in the crossfire of chain store turf wars. And Walgreens is growing. "We have a global footprint of 11,000 drug stores, 370 distribution centers operating in 25 countries with a pharmacy supply chain unmatched in the world," Walgreen's chief executive Gregory Wasson told investors in January, according to a Washington Post article headlined "Walgreen's plan to achieve global drugstore dominance." In the East Bay, concerns extend beyond Solano Avenue as chain pharmacies like Walgreens open new branches and also expand the kind of retail they offer, becoming more like department stores. By offering relatively cheap goods in a range of categories, a new Walgreens can threaten local businesses beyond pharmacies — including grocery stores, gift shops, salons, and more. "If they carry the same products across the street, they are going to be carrying them for less money, because they get a better deal," said Shelly Alvarez, store manager at Greetings, a gift shop on Solano Avenue that is located a block from the proposed Walgreens. Alvarez was referring to the fact that large retail chains receive price discounts from manufacturers because they buy in bulk. Sal Nassar of Sal's Pharmacy argued that Walgreens won't be bringing any products to the neighborhood that shoppers and residents can't already get. "It will affect all these little mom-and-pop stores. ... It will ruin the neighborhood." Stacy Mitchell, senior researcher at the Institute for Local Self-Reliance, a nonprofit that advocates for small businesses, noted that competing companies like CVS and Walgreens often scramble for territory in neighborhoods even if there's not a clear local demand for a new store. And if it doesn't work out and they decide to vacate, "The cost to them is nothing, really," she said. "The potential upside is that you grab all this market share ... and block your competitors from coming into those locations." In her book Big-Box Swindle, Mitchell, using Consumer Reports data, also argued that independent pharmacies often outperform chains on a variety of measures, including knowledge of the pharmacist and speed with which prescriptions are filled. Further, "We know that independent pharmacies buy goods and services locally," said Mitchell. A recent report by the San Francisco Planning Department noted that local retailers may spend up to 9.5 percent more within the local economy than chain stores (though they charge prices that average 17 percent more). Kurt Beleck, vice president of operations at Agree Realty, said the Solano Avenue site needs a corporate developer for several reasons. "There's a huge missed opportunity if this thing gets killed because certain people feel they're speaking for the entirety of the community." He argued that the necessary site remediation is very costly: "You really need a retailer that ... has some deep pockets. You can't put mom-and-pop stores in there. They will not be able to pay rent .... It's only going to happen if it's a company like a Walgreens." He further argued that "Solano desperately needs a vibrant sort of public space," adding that "it would be very difficult for people to say that we are not being sensitive to the residents and the needs of the community." Agree Realty, Beleck said, referring to the proposed street improvements outside the planned Walgreens, has "been more than open to spending significant dollars to make this public realm in front of the store a very vibrant place for people to congregate." Regarding the impact on existing businesses, Beleck said, "You can see other examples of Walgreens coexisting with other small ... independent pharmacies." And when asked about corporate competition driving this proposed new location, he said, "It has nothing to do with CVS. ... That just doesn't make any sense." Walgreens spokesman Phil Caruso said in an email that the company takes several factors into consideration when determining where to open a new store and produces "more than 100 pages of research on every site we consider. That includes information on demographics, population density, traffic patterns, how the area is currently being served and other topics. We think Solano [A]venue is a good location in Berkeley for us to bring convenient and accessible health products and services to the community."